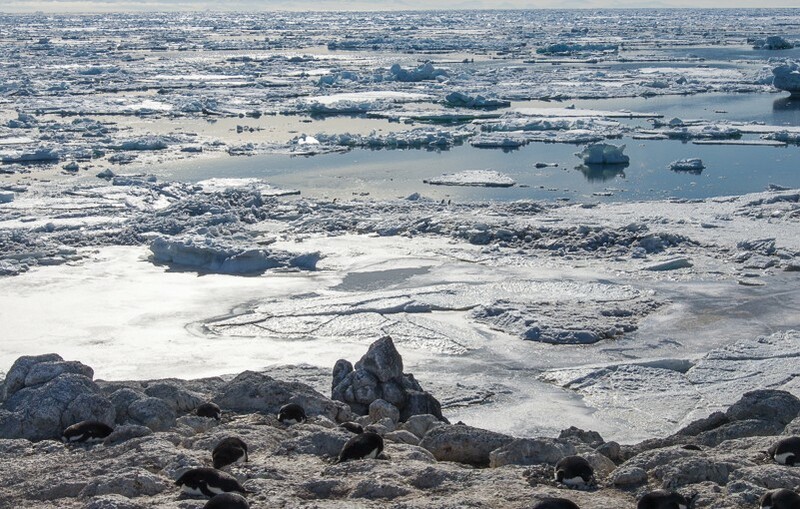 Want to see more Antarctica photos? Visit my Flickr site. 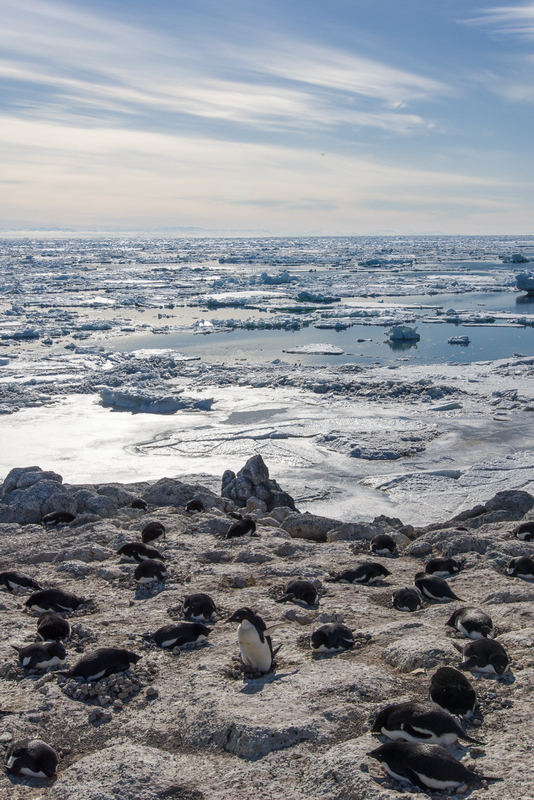 Nesting penguins overlook the sound, which filled with floating icebergs over the past few days. Small groupings like this are called subcolonies. 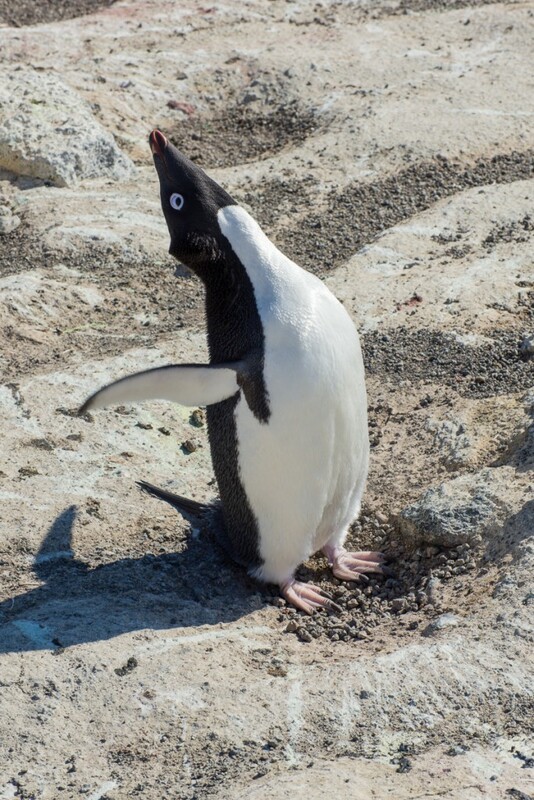 They tend to distribute themselves fairly uniformly, a couple of penguin-lengths apart, and face different directions. Too close, and they get annoyed with each other, and push the interloper away with a squawk. The researchers keep track of the banded birds to see if they are nesting and have eggs. 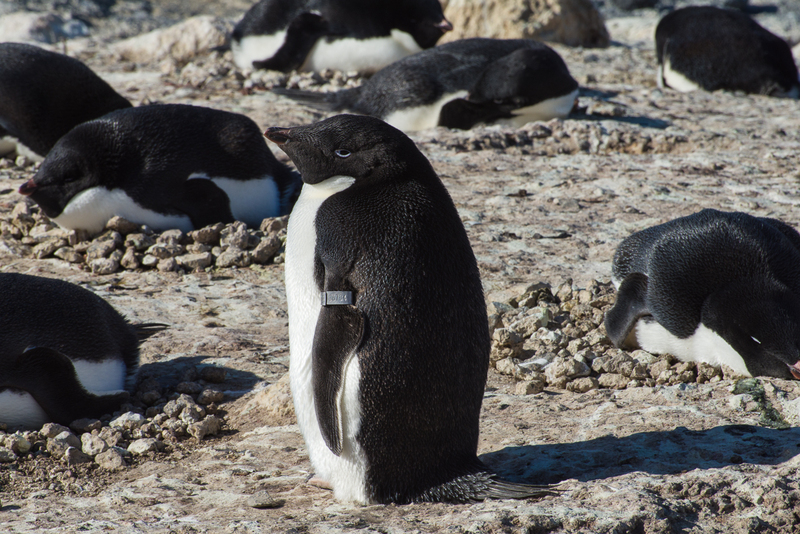 It’s my third day at the Cape Royds penguin colony, which consists of Adelie penguins. 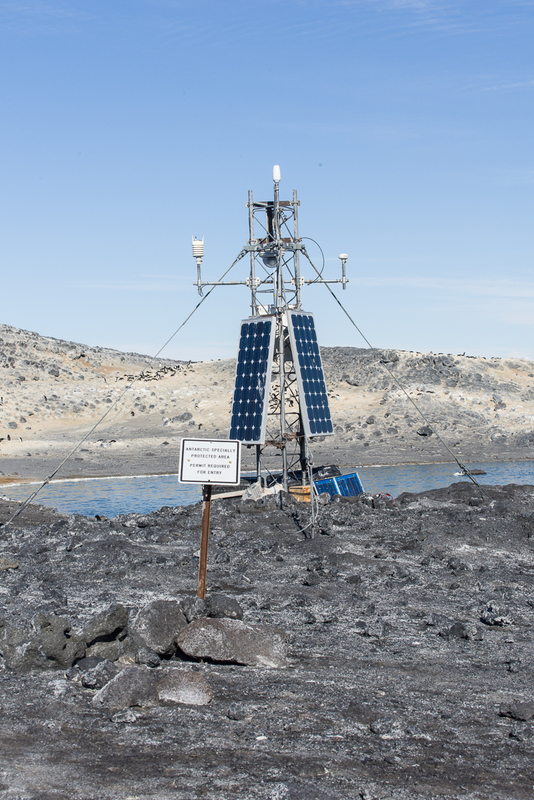 It’s a relatively small colony, with the larger ones at Cape Crozier and Cape Byrd, and Beaufort Island, which are all less severe environments than Cape Royds, which is basically further south. Katie Dugger, who has been keeping track of the banded birds this season and their nesting activity, estimates that there are a little less than 2,000 breeding pairs, i.e. 4,000 penguins. The ones that haven’t bred go out to sea, but will come back after the chicks have hatched. Right now, at any given time, about half of the birds are on land and their mates are in the water. The eggs have been laid, so they’re swapping places sitting on the nest about every other day. Katie knows this from keeping track of the banded birds. Chicks are banded at the end of each season. 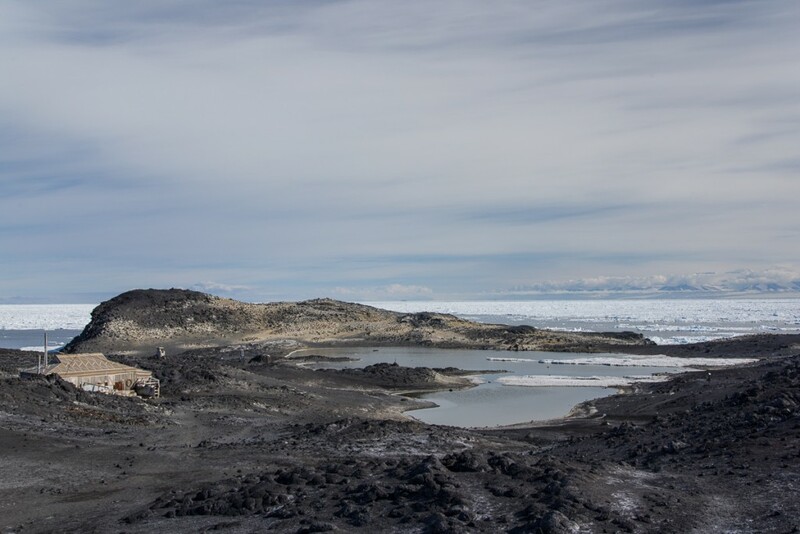 To get to the colony, you walk about 5 to 10 minutes down a trail past one of the historic huts used by Ernest Shackleton’s Antarctic expeditions. Like other historic huts in the area, the hut and the artifacts and supplies left behind by those early explorers some 100 years ago are maintained and conserved by New Zealanders. The huts are kept locked, and you may only enter with a trained hut guide, who could be a New Zealander or an American. I didn’t come with someone who had the training, so I haven’t been in, but if you’re curious, another photographer with the Antarctic Artists and Writers Program, Shaun O’Boyle, did a lot of shooting in there. I highly recommend his blog Portraits of Place in Antarctica. He got here in October and just left. His project involved the architecture and manmade structures here, and he does beautiful work. 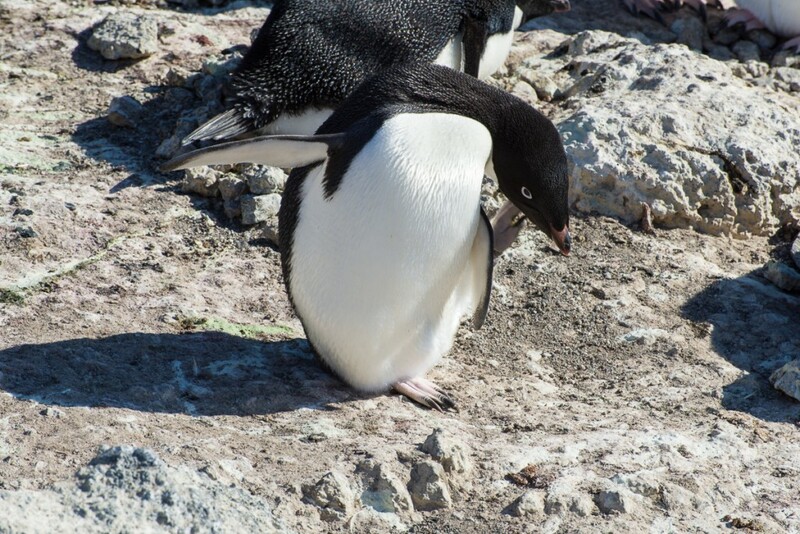 This penguin has stood up to adjust its position on the egg. This penguin has one egg, but some have two. 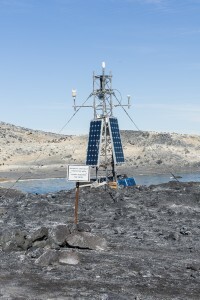 A camera mounted on the other side of this tower takes the time lapse photos of the colony posted on penguinscience.com. A sign marks the beginning of the protected area. A permit is required to enter. It’s a protected area, so not anyone can enter. 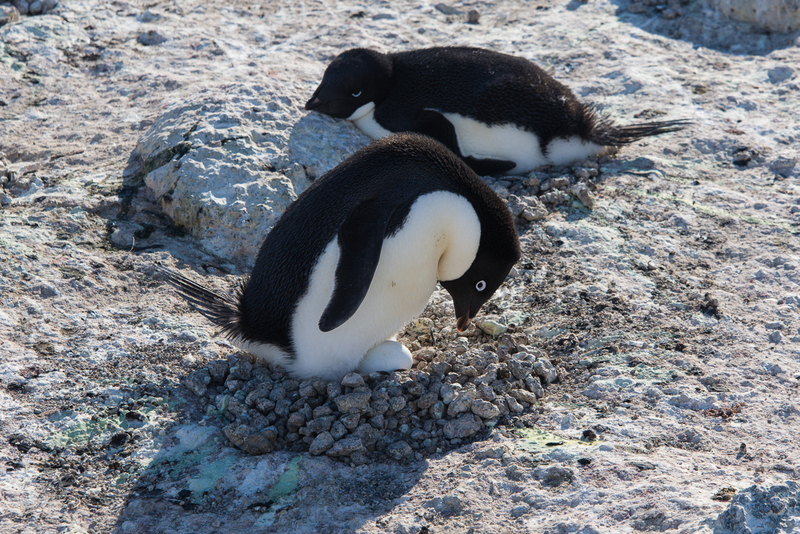 Right now if you watch the penguins, their activities revolve around nesting. They’re either sitting on a nest, occasionally standing up to shift position and settle back down. Or they are picking up rocks in their beaks to add to their mate’s nest. Or they are in the water or coming and going from the water to eat krill and silverfish, their main diet. Penguins go down to the water to eat, then return to the nest to give their mate a turn. 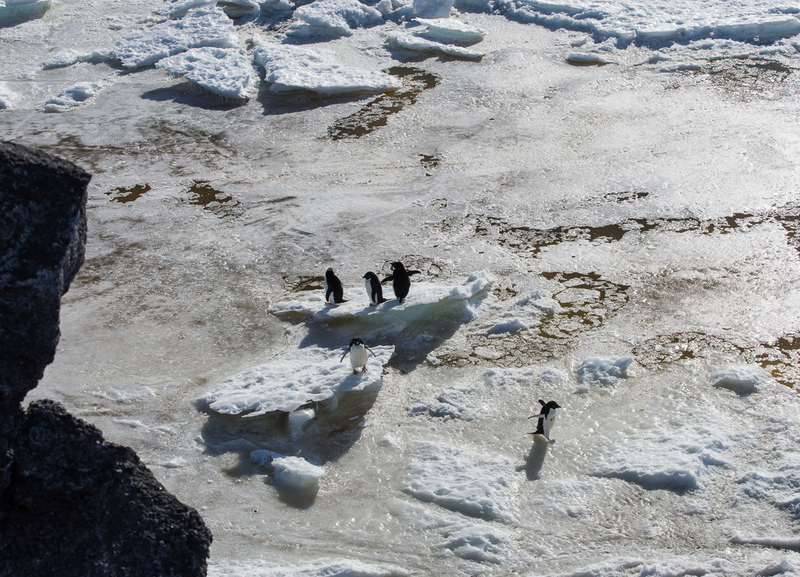 When they go in the water, they tend to form little groups, then walk to the ice edge together and enter together. 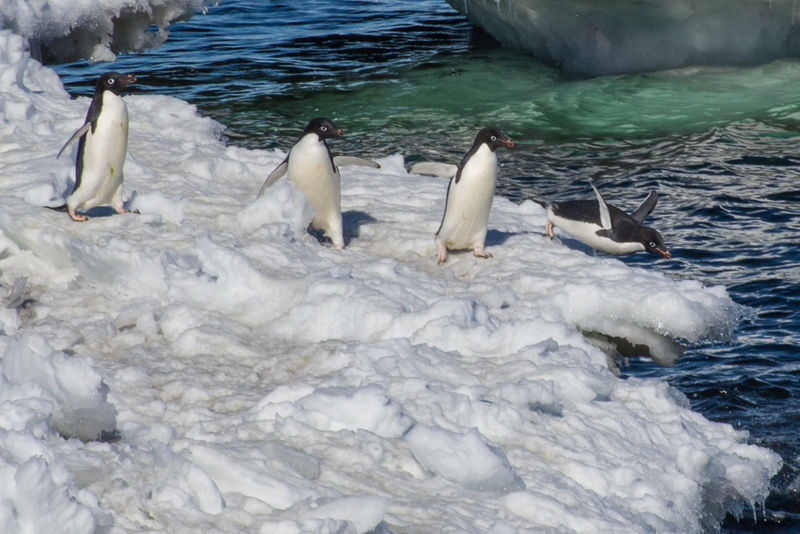 They just join whatever other penguins happen to be on their way down the slope to swim. Heading for the water. Look at those gestures. They’re very human-like. No wonder we are tempted to anthropomorphize them. 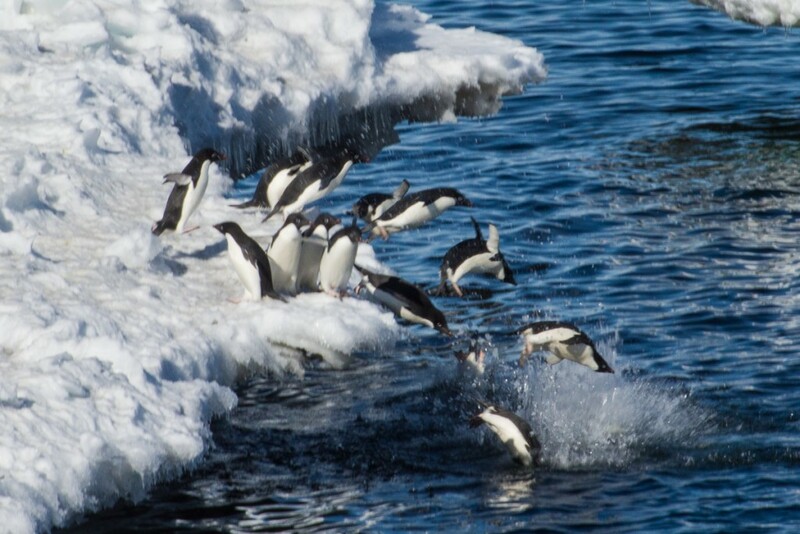 Semi-synchronized swimming: penguins take the plunge as a group. So, friends and blog followers, yesterday I figured out how to shoot video with my Nikon SLR. I’m getting better at it as I go along, so I have some good footage already, but the Internet upload speeds are sloooowwww, so I can’t just put them all up at once. My first effort is admittedly not in as good focus as the ones I made today, but it gives you a look at penguins in action nonetheless, and they are, frankly, adorable. You can find the video on YouTube here. As I get them online, I’ll note them in this blog, or just subscribe to my YouTube channel. And of course, Jean Pennycook has posted a lot of photos and videos of this colony at PenguinScience.com.